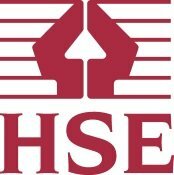 Thinking about hiring an expert Tree Surgeon in East Molesey? GraftinGardeners have years of experience working in arboriculture and can provide you with any tree surgery services you require. Our tree surgeons operate in KT8, surrey and surrounding areas and always produce professional results each and every job. Whatever tree services you need, we can supply them. Call us today to arrange a tree specialist to come and inspect your trees and provide you with a free on-site quotation. 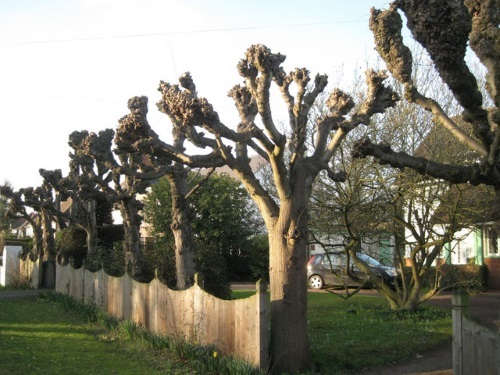 GraftinGardeners are expert tree surgeons in East Molesey and work in all surrounding areas. Our tree company provides a first class tree surgery service. Every member of staff is fully trained to carry out all aspects of tree surgery and have all the relevant qualifications, as well as the latest equipment. If you require tree surgery in KT8, or any local area, our tree specialists can help. We could be at your premises the same day, to provide you with a free quotation. Do you want a dead, dangerous or unwanted tree removed from your garden or property? Our tree surgeons are experts at felling trees and have removed many trees in the tightest of situations. We have all the right experience and equipment to ensure every tree is felled safely and without causing damage to your property. We cut trees down in a safe and well controlled manner by means of sectional or straight felling (where pace allows), and closely follow all UK safety felling laws. 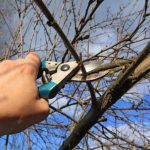 DIY pruning is generally not recommended unless you have a good understanding of tree care and maintenance. Factors such as age, condition, size, shape, species and location should be taken into account before making any cuts. Our tree surgeons take all the above factors into consideration and always cut, trim, prune and shape trees to the guidelines specified in the British Standards (BS 3998), ensuring your trees are left healthy and in a well-balanced state, every completed job. Tree stumps are tough and require specialist stump removal equipment to successfully remove them. 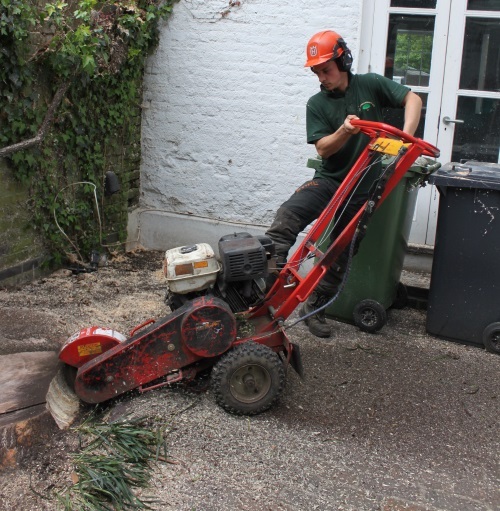 Our tree surgeons have the latest hand tools and stump grinders to remove the most stubborn of stumps and could have your unwanted stump removed within the hour. We will grind out the old stump, fill in the remaining cavity with soil or grinding waste and compact the ground, leaving you with a level surface and a clean site. Call now for a free stump removal quote. Weak, damaged and diseased trees are most vulnerable during severe weather and storms. This is the time they tend to fall down most, potentially leaving you with damage to your home, garden fence or driveway. To avoid this as much as possible, it is recommended to have your trees inspected regularly. It’s better to fell a dangerous tree then to have it land on your property. If you need a fallen tree removed, contact us on the number above. Our emergency tree service runs 24 hours a day, 365 days a year, for all tree emergencies. Well trained ivy can be a nice additional feature to your home but requires a lot of maintenance. If you don’t maintain it frequently, it will grow where you don’t want it, causing damage to structural elements of your home. For example, wood work can rot, roof tiles can lift, guttering can break and exposed brick work and joints can be compromised. If you need someone to maintain you ivy and climbers we can help. Our arborists can cut, trim and shape ivy and train it to grow away from important elements on the house. However, if you just want it removed we can also help. We will remove it from the roots and lay down herbicides to stop it growing back. Just give us a call for a free quote. 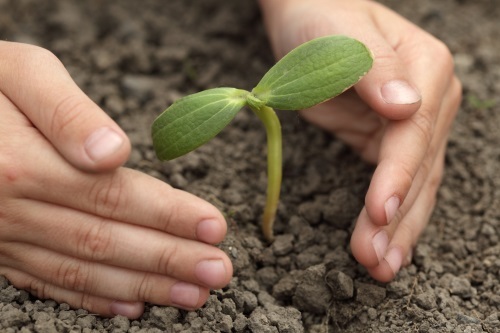 Want the advice of our arborists before planting a new tree in your garden? GraftinGardeners are tree cultivation experts and have a good understanding of tree management. We can plant and relocate trees on your property and will guide you through the whole process, from the souring of the best specimens, to advice on optimal plating locations and tree aftercare. At GraftinGardeners, we care about tree care, so trust us to carefully plant your expensive trees. Do you need your hedgerows, box hedges, conifers or shrubberies trimmed? 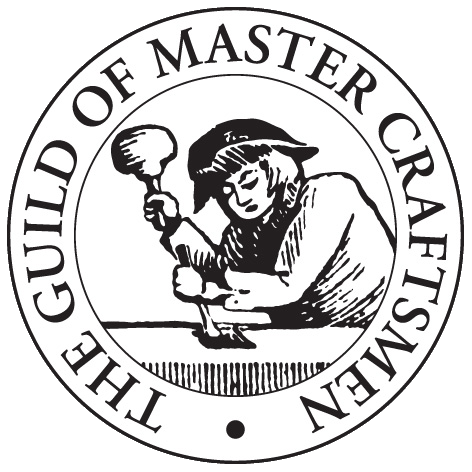 At GraftinGardeners, we pride ourselves on delving the highest quality of work and guarantee to get the shape and look you desire. Our arborists have been trimming hedges for over a decade and can cut, trim, shape and style any hedges. We work with hedges of all sizes, so don’t hesitate to contact us if you need the hedges outside the front of your house trimmed. To pollard a tree is to cut back all the upper most branches. It is a heavy form of pruning and is used to promote new growth and denser foliage in the tree and also to prolong the life of the tree. It is commonly used on willow and poplar trees, to stop them from growing out of their boundaries and is a good method of control. If you need your trees pollarded, trust us to do it with care.